The Voice Kids Season 2 top 4 finalists revealed! - Balita Boss! Balita Boss! 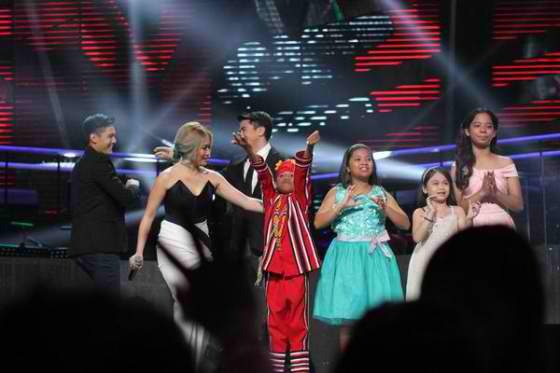 Entertainment The-Voice-Kids The Voice Kids Season 2 top 4 finalists revealed! The Voice Kids Season 2 top 4 finalists revealed! The Voice Kids Philippines season 2 finalists have been chosen! Show's hosts Luis Manzano announced the four finalists on results night Sunday, August 23, 2015 at the Newport Performing Arts, Theater, Resorts World Manila, Newport City in Pasay City. The first artist named a finalist on live show was Team Lea's Reynan Dal-Anay. Elha Nympha of Team Bamboo was the second artist to move onto the finals. The third young singer called as finalist was Esang De Torres of Team Lea Salonga. The last artist pushed through to the finals was Sassa Dagdag from Team Bamboo. Reynan, who sang an emotional performance of Asin’s “Itanong Mo Sa Mga Bata,” topped the semis with 32.98% of votes. garnered the second highest number of votes with 19.24%. She sang the OPM classic “Salamat, Salamat Musika” during the Saturday night’s performance. The third highest number of votes was given to Elha who got 18.23% of votes with her performance of “You’ll Never Walk Alone." Sassa completed the top 4 finalist who got 13.71% votes. She performed Beyonce's "If I Were A Boy" during the semifinals of the competition. Both Zephanie Dimaranan and Kyle Echarri got the lowest number of votes, 6.43 and 9.4 percent respectively, thus eliminating Team Sarah from the competition. The Voice Kids Philippines Season 2 grand finals set on August 29 and 30, 2015.